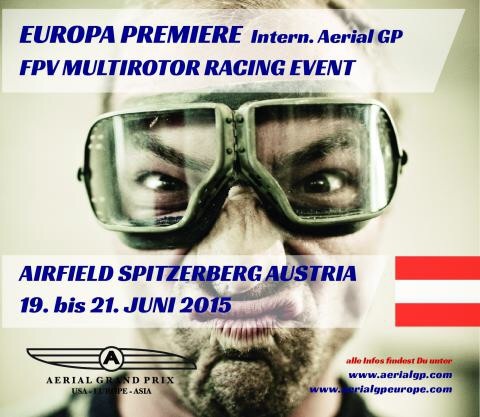 I will be attending the European Aerial Grand Prix in Austria from the 19th to the 21st of June! I will be bringing some prototypes of a new copter that might make it into a race. Anyone else coming to this awesome event? ← Introducing the Naze32 Tricopter frame! I have been following you for many years but never bother to register until now. I always though all the good staff is so far away but this is getting it relay close to me. I wish you would know/post that a little bit sooner 🙂 Well I’ll see what I can do. Hi David, What is the electronics you use for the Prototype, would like to get it and them when you unveil your mini I just need the frame. I can’t agree more. I need a shopping list. I think I caught a good look at it in RCSchim’s last video. Details pease!?!?! just saw a video of RCSchim about the GP, If I would have known that all my RC-Idols are there I would have driven the 500km. To me all flushed down the toilet the moment metaldanny wasn’t present.. Sorry for the late post. Had really poor internet connection on my travels. The new mini tricopter was unfortunately much to quick for the small course. Thank you to all that came out to meet me. It was awesome to shake your hands and hear your stories! I recently built a ‘Mini’ 280mm Tricopter that was essentially a 1/3 scale of the big one using the ‘vector tilt’ mechanism and 10cm carbon fibre square tube from hobbyking. (2204 motors, six amp Afros, ‘afromini’ Naze, 5g bluebird servo, All the same construction techniques as the big V3. I upgraded it to the latest Tricopter firmware, and it flies beautifully. Leaps tall buildings in a single bound, and goes for 11 minutes. So I’m sure you’ll surprise them all… Little tricopters are _very_ agile. I’ve been meaning to suggest a ‘short arms’ option for the v3 by just halving the arm length, and perhaps a smaller battery tray. Looking forward to seeing the new creation.